The 147 homes were earmarked for the site marked H51 in the Local Plan. Image from Warwick District's Local Plan. 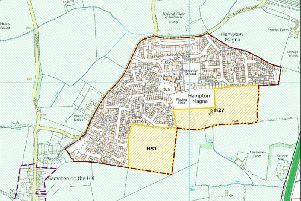 Plans that would see 131 homes built on Hampton Magna have been recommended for approval. The application is for land south of Lloyd Close and this is the second time that developer Richborough Estates Limited, has put plans forward for this site. Planning officers have recommended that councillors grant planning permission when it goes before Warwick District Council’s planning committee on Tuesday January 29. The site was part of the Green Belt but was removed and allocated for homes in the Warwick District Local Plan, which was adopted in September 2017. It is marked as site H51. On June 11 2018 the developer’s first plans, which were for 147 homes, were put before a delegated committee from Warwick District Council. There were around 150 letters of objection to the plans. The developer was refused planning permission for a number of reasons including; site layout, the scale of the development and that the development would be ‘detrimental to highway safety’. These new plans, which would also have 40 per cent affordable housing also includes a children’s play area and areas of open space. Access to the development would be off Daly Avenue with a priority junction and there would be an secondary (emergency) access from Mayne Close. The plans have more than 120 letters of objection including Budbrooke Parish Council.